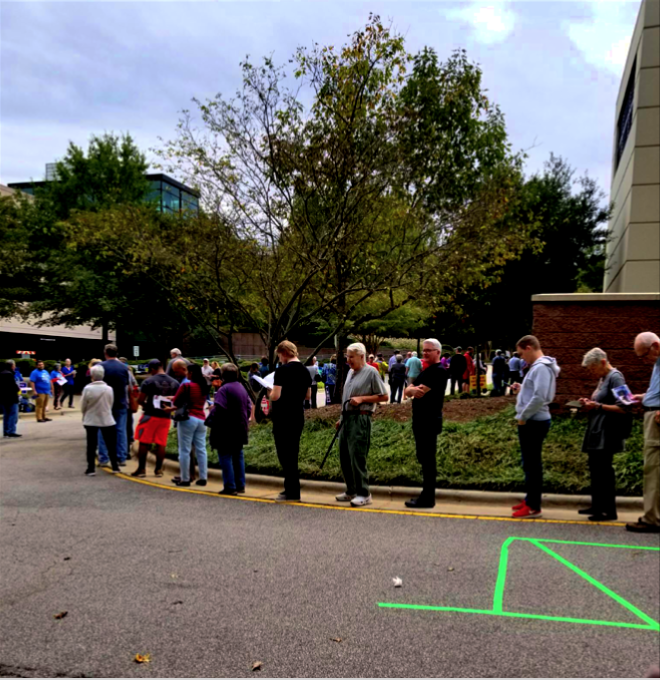 According to data from the North Carolina State Board of Elections and Ethics Enforcement released October 19, 136,300 voters cast ballots at Early Voting sites on the first day of this year’s 18-day Early Voting period. By contrast, over 121,200 North Carolinians cast ballots on the first day of Early Voting in 2014, the last midterm election, and 165,900 cast ballots on the first day of Early Voting in 2016. Wednesday’s Early Voting total represents a 12.5% increase in the number of ballots cast on the first day of Early Voting since 2014, surpassing the 6% growth in voter registration that occurred during that time. The increase in the first day from 2014 is notable for a variety of reasons: the 2014 period was only 10 days, while this year’s is 18 days; the 2014 General included a high profile Senate election which this midterm does not; and the EV period started on a Wednesday this year instead of the usual Thursday. That said, some counties that did not open satellite locations (locations other than the Board of Elections) on the first day of Early Voting in 2014, did have satellite sites open on the first day this year. Especially given the variety in the lengths of Early Voting periods in recent elections, it is hard to gauge turnout from the only the first day of Early Voting this year. Analysis: "First Day of Early Voting Shows Overall Turnout Up, Possible Trends to Watch"
Week One analysis of 2018 General Election Turnout. Challenges remain for voters in hurricane-impacted counties. While the statewide turnout on the first day of early voting increased from the last midterm election, turnout from the subset of 28 counties receiving federal disaster assistance in the aftermath of Hurricane Florence was down from 2014, especially for Black voters. Individual counties varied of course, with the increases in first day numbers from Brunswick, Harnett, Moore, and New Hanover, among others, compared to 2014 The five counties with the greatest percentage decrease in voter turnout on the first day from 2014, Scotland, Pamlico, Onslow, Jones, and Richmond, are all receiving federal assistance in the aftermath of Hurricane Florence. Cumberland saw the largest decrease in the number of voters on the first day of Early Voting compared to 2014. Twenty-two of the 28 counties receiving federal assistance saw a reduction in the number of Black voters who cast ballots on the first day of Early Voting from 2014. Voter turnout was up from 2014 in 7 of the 10 counties with the most registered voters. Across the state, Forsyth, Durham, Wake, and New Hanover Counties saw the greatest increases in the number of first day voters from 2014. Durham and Forsyth saw the greatest increases in the number of Black first day voters. In particular, Forsyth had five times the voters on the first day, 5,216, compared to 2014 when there were 1,028, and more than double the number of Black voters. Durham had almost four times the number of voters on the first day (4976), compared to 2014 when there were 1,266, and more than double the number of Black voters. Hyde and Lincoln saw triple and double the number of Black voters compared to 2014, respectively. New Hanover and Rowan also saw more than double the number of voters on the first day, compared to the first day of 2014. That said, much of the changes in Durham, Forsyth, Hyde, and New Hanover are likely due to the fact that the satellite sites were not open on the first day of the Early Voting period in 2014, but were open on the first day this year. If nothing else, the dramatic changes demonstrate the immense importance of having Early Voting locations throughout the County. Across the state, fewer Black voters voted on the First Day of Early Voting (26,593) than in 2014 (32,208) or 2016 (45,857), and this held true for Black women and for Black voters under 26. In the 6 of the 8 counties where the majority of registered voters are Black, fewer votes were cast Wednesday than on the first day in 2014– although three of the counties have had small declines in registration since then. In 4 of the 8, there are fewer sites open this year compared to 2014, and six of them will have fewer weekend days than they did in 2014. First day turnout for Asian voters, Native American Voters, and Biracial Voters outstriped 2014 numbers– 989 Asian voters cast ballots compared to 407 ballots in 2014, 624 Native American voters cast ballots compared to 499 in 2014, and 553 Biracial or Multiracial voters cast ballots compared to 334 in 2014. Following reports of spikes in registration among the youngest voters this summer, voters under 26 surpassed 2014 numbers on the first day of Early Voting – 4,481 voters under 26 cast ballots on Wednesday, compared to 2,890 in 2014. This trend held true for women under 26, 2,125 of whom cast ballots Wednesday, compared to 1,408 in 2014. Democratic turnout dipped slightly from 61,443 ballots on the first day in 2014 to 58,982 ballots Wednesday, but still made up the largest share of votes by one party. In contrast, Republican turnout on the first day of Early Voting (41,665 ballots) surpassed 2014 numbers (35,820) and even slightly exceeded 2016 numbers (40,606). Unaffiliated voters had the largest jump from 2014, with 35,324 ballots cast Wednesday compared to 23,776 in 2014 – a 49% increase – surpassing the 23% growth in registered Unaffiliated voters in that time. A mixed start to Early Voting this year is not entirely surprising given the last minute changes to Early Voting, which lead to site closures around the state and this year’s unusual Wednesday start. Over the summer, Senate Bill 325 put pressure on counties to reduce the number of Early Voting sites and weekend hours during the Early Voting period. The bill also proposed eliminating the popular last Saturday of Early voting, which is disproportionately used by Black voters. After rigorous advocacy by voter advocates, the legislature added the Saturday back for 2018 only–leading to this year’s 18 day cycle–but the majority of North Carolina counties cut the number of sites, availability of weekend Early Voting hours, or both. Since Early Voting is 18 days long this year, there is no perfect election to use for comparison. In the last midterm election, the Early Voting period was truncated to only 10 day by legislation that was eventually overturned to restore 17 days of Early Voting in time for the 2016 General Election. Democracy NC will release in-depth analyses of turnout patterns across the state on Mondays and Thursdays throughout the remainder of the Early Voting Period. Analysis based on one-stop absentee ballot data available from the North Carolina State Board of Elections and Ethics Enforcement.